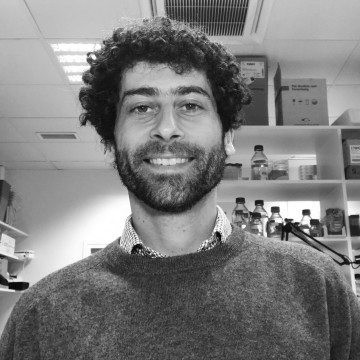 Nicola Festuccia will be leaving the LMS in May to continue the work started in his Regulatory Dynamics and Cell Identity group at the Institut Pasteur in June 2019. Each cell in a complex organism expresses a defined set of genes, which determine its identity. During development, or directed in-vitro differentiation, new cell types are generated by activating specific transcriptional programmes in a timely and regulated fashion. In addition to the coding genetic information, each cell must therefore possess and be able to access the regulatory information that directs such an ordered generation of diversity. Indeed, a substantial proportion of the genome serves a regulatory function and organises in discrete functional units, called cis Regulatory Elements (REs). RE harbour sequences of DNA that are recognised and bound by Transcription Factors (TFs), proteins that are able to activate or repress the expression of genes proximal to the RE they occupy. Generally, TF need to cooperate to remodel the chromatin at RE in order to access their binding sites on DNA and regulate gene expression. It is thus the juxtaposition of TF binding sites present at REs in different combinations and spatial arrangements that constitutes the code by which the regulatory information is stored. Conversely, the particular set of TFs expressed in a cell determines which part of this regulatory information is accessed, and collectively define the ensemble of active REs characteristic of that cell type. These processes confers specificity to gene regulation and are at the base of the maintenance of cell identity, yet in many aspects they remain incompletely understood. We focus on describing in detail how in living cells TF interact with nucleosomes and dynamically reshape the chromatin at REs, influencing each other’s occupancy and allowing combinatorial control over transcription. The group builds on the study of how different TF binding sites architectures influence these molecular dynamics to mechanistically understand the dependence of REs on the activity of specific TFs, and how this defines their behaviour during cell identity transitions. More broadly, we aim at revealing the intermediate states through which regulatory networks are restructured to understand the logic and the driving forces allowing the progression from one configuration to another. We work to clarify whether the activation or inactivation of REs is an ordered process, and whether it is possible to identify particular elements “leading” these transitions. Finally we are interested in exploring the influence that the disruptive events occurring during cell division have on the stability of regulatory circuits, and how they might play a role in triggering their reconfiguration. Murine Embryonic Stem Cells (ESC), cell lines derived from early embryos, are an ideal model for our studies: their uncommitted identity is strictly dependent on the activity of a well characterised group of TFs and they possess a broad differentiation potential. We employ the initial stages of ESC differentiation as a model for studying how TF dynamically control the activity of regulatory networks. We combine novel tools for genome editing with massively parallel screening to address these problems within a physiologically relevant context and at genome-wide scale. We ultimately aim at predicting the activity of REs in stable cell types and during differentiation based on their DNA sequence, making it possible to design synthetic regulatory circuits able to perform tasks of clinical and practical relevance. Festuccia N*, Owens N*, Papadopoulou T, Gonzalez I, Tachtsidi A, Vandoermel-Pournin S, Gallego E, Gutierrez N, Dubois A, Cohen-Tannoudji M, Navarro P. (2019). Transcription factor activity and nucleosome organization in mitosis. Genome Research, 29, 250-260. Festuccia N, Halbritter F, Corsinotti A, Gagliardi A, Colby D, Tomlinson SR, Chambers I. (2018). Esrrb extinction triggers dismantling of naive pluripotency and marks commitment to differentiation. EMBO, 37(21). Festuccia N, Gonzalez I, Owens N, Navarro P. (2017). Mitotic bookmarking in development and stem cells Development 144(20):3633-3645. Festuccia N, Owens N, Navarro P. (2017). Esrrb, an estrogen-related receptor involved in early development, pluripotency and reprogramming. FEBS Journal doi: 10.1002/18733468.12826. Festuccia N, Gonzalez I, Navarro P. (2016). The Epigenetic Paradox of Pluripotent ES Cells. Journal of Molecular Biology 429(10): 1476-1503. Festuccia N, Dubois A, Vandormael-Pournin S, Gallego Tejeda E, Mouren A, Bessonnard S, Mueller F, Proux C, Cohen-Tannoudji M, Navarro P. (2016). Mitotic binding of Esrrb marks key regulatory regions of the pluripotency network. Nature Cell Biology 18(11): 1139-1148. Festuccia N, Osrono R, Wilson V, Chambers I. (2013). The role of pluripotency gene regulatory network components in mediating transitions between pluripotent cell states. Current Opinions in Genetics and Development 23(5):504-511. Festuccia N, Osorno R, Halbritter F, Karwacki-Neisius V, Navarro P, Colby D, Wong F, Yates A, Tomlinson SR, Chambers I. (2012). Esrrb is a direct Nanog target gene that can substitute for Nanog function in pluripotent cells. Cell Stem Cell 5;11(4):477-90.